Roses are some of the most beautiful flowers in existence. They are one of the most commonly grown flowers around the world because there are so many different varieties and they will grow in most climates around the world, needing no special heat or cold requirements to flower. They are however not without problems. 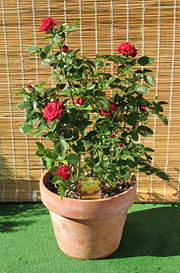 In order to grow roses first consider the location in the garden. Remember the colour of the rose and judge if it fits into the layout your garden. Just because the rose itself might be pretty does not mean you can just place it anywhere, it should still match your colour schemes. Consideration should also be given to the height of the surrounding plants, Roses can grow in numerous sizes from huge standards to dwarf to large hedges and overhangs. Roses are a strong enough flower to hold there own needing nothing else to set them off. In the case of climbing roses ensure you have plenty of frames for them to grow on. In planting the rose ensure its in a place where it gets approximately 6 hours of unfiltered sunlight a day if you want it to thrive. Further plant it out with a Rose mix which can be brought in bags and are made to ensure the right combination of minerals to get the best out of your rose. Make sure to water them until they are established. One of the greatest problems with Roses are that they attract Aphids. In fact a healthy bush seems to mean just a greater feast for these pests. A shop brought insecticide used as per instructions soon deals with these pests. If you want a more organic approach try a generous garlic spray. Other problems can include scale, blackspot and fungus. Once again go to your shop or garden center, there are sprays particularly dedicated to these problems. 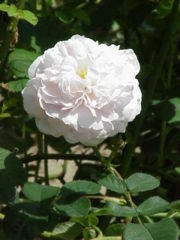 Apart from these on the whole Roses are easy to grow which is why they are so popular. They look beautiful and the colours go from bright reds to yellows, orange, apricot, pink, blue, brown and with selective breeding the numbers just keep growing. After flowering season don’t forget to pune heavily. I don’t think one can over pune a rose. They just grow back with even more vigor the next season. In the case of grafted roses make sure you cut off any suckers from the root stock. Roses are beautiful in the garden, but its hard to resist the temptation and cut some to bring inside. If you are going to do so, cut them just on the point of opening. If they are already open they won’t last long at all. To increase how long they last try putting them in Sprite (I know it sounds strange but give it a go).